Last weekend, the dementia care and advocacy community lost one of its most unique and powerful voices with death of Richard Taylor. A few years after being diagnosed with probable Alzheimer’s-type dementia, Richard Taylor emerged as a passionate, uncompromising advocate for people living with dementia. He challenged stigma wherever he found it, and was often a harsh critic of the Alzheimer’s establishment, which he argued over-emphasized the search for a future cure at the expense of programs to support people struggling with dementia today. Anyone with an interest in dementia should know his remarkable book, Alzheimer’s from the Inside Out. I wish I had gotten to know Richard much better. I met him through email and then at a conference about five years ago, and continued to stay in touch with him from time to time. The interest he took in my work on dementia has been an important motivation for me to keep going. Blink – there went another three months. Don’t quit reading yet – this is not going to be just another apology for failing to keep up with this blog. I have no illusions about the world needing it, waiting for it, or missing it when it’s not there. This post is frankly about what I need, and what I fear as I grow deeper into middle age. But bear with me, I do need to explain my absence. There are, of course, perfectly good reasons why I have not kept up with this blog. I teach full time – which for me means four classes per term, suffice it to say a load most academics would consider incompatible with research and writing – and have taken on the administrative burden of directing a rapidly growing graduate degree program. I try to stay involved in the broader academic world. In the spring, I participated in an excellent workshop on MCI (which I will try to blog about soon), and reviewed a book manuscript and a book proposal for two different academic presses. And I have a family and friends, commitments to church and civic life. And I try to give those relationships and affiliations the time they need. I have a life, as they say. So yeah, I’ve been busy. There are, of course, also some not so good but perfectly understandable reasons why I have not kept up with this blog. I waste time. I get distracted by social media and lost in the interwebs. I forget priorities, get caught up in a labyrinth of delusion and self-doubt. In other words, I’m human. Oh, there is no end to reasons why I have not kept up with this blog. As I suggested in my last back-from-the-dead post, the idea of keeping a blog is absurd, but really no more absurd than any of my dreams of creative work – and that’s my reason for trying to do it. Life gets in the way. But this is not a complaint or an apology. My life, for all of its imperfections, is good. And life has been like this for a long time, decades at least, the steady accumulation of responsibilities large and small filling my life to overflowing, dreams and aspirations bobbing along in those waters like survivors of a shipwreck. But what’s new in my life now is real awareness that it is finite. I hope to live a long, healthy life, and continue creative work deep into old age. That’s possible, but there are no guarantees. A few months back, I got news of the death of a good friend from grad school that I sadly had fallen out of touch with over the decades. And just recently I’ve learned that another old friend, some years younger than me, is dealing with a serious cancer. These are tragedies, but they are not unexpected, nor unusual events in the long course of human life. I may be able to continue to do creative work for three or more decades, that’s a reasonable hope. But there are reminders every day that I may have much less time than that. Of course, I can still remember being young, when the problem was knowing what to do with the seemingly endless void of time, days stretched out to a barren, seemingly infinite horizon. But I remember youth too well to want to go back there even if I could. No, I’m happy to accept this as my dilemma, my rock of Sisyphus, my life: an endless, growing pile of things to do, more than I can ever hope to accomplish in the limited time I have left. But on good days at least, I don’t wallow in narcissism. My creative work is not about my self-fulfillment as an individual, a man. Not really about me at all. My best ideas and dreams, to the extent that I am able to make them real through creative work, are nothing more nor less than a small, ultimately anonymous contribution to the vast human susurrus, the mumbling into being of a meaningful world. Still, masculine melodramatics aside, Hemingway’s musings undeniably capture something real about being human in the modern world. Acknowledging that my life is finite, I can’t help but think about what I will inevitably leave undone: At least two scholarly books fairly concrete in conception, though the necessary research is barely begun; more vaguely conceived but perhaps more vividly imagined, a series of novels, stories and poems that would be a dramatic departure from the kind of creative work I’ve done so far. If I live to be a hundred, I probably could not accomplish half of this. But, for me at least, staying alive means keeping these projects alive in my mind and doing what I can to make them real in the world. So I find it unnerving to think about these grand ideas and dreams disappearing with my death, their potentiality flickering out within the dying neurons enclosed in my skull. Aging, Death and the Completion of Being. This comes from the title of a 1979 book edited by my mentor and dissertation advisor, the late David D. Van Tassel, one of four books he edited from the late 1970s through the early 1990s that laid the foundation for the historical study of aging. 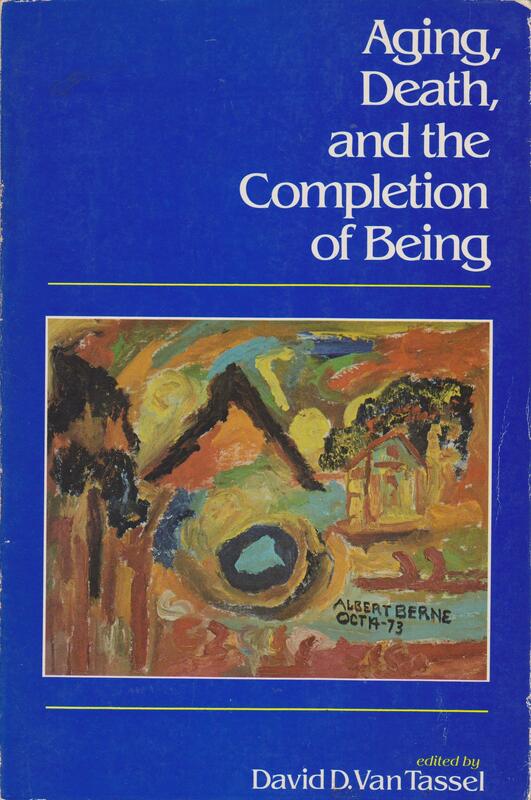 The memorable phrase, “the completion of being” has always struck me as saying something important about aging, but I’ve never been sure what. From the perspective of a hopelessly overbusy middle age, bringing my own life to final and satisfying completion is difficult to imagine. Perhaps the art of living a good life, whenever the time for its ending comes, is to find closure and completion in the face of all that is left undone.